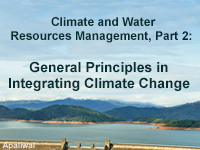 This lesson describes a common approach used by the United States Bureau of Reclamation to scope a study on integrating climate change information into water resources management and planning. Learners will become familiar with the types of questions that must be addressed for considering climate change impacts when scoping their study. Examples are given for several different water resources mission areas. Note that this is the second of a two lesson series, the first one is titled, "Climate and Water Resources Management, Part 1: Climate Variability and Change." Helped my understanding about how to approach water management with climate change. It is very good programme. we can check our knowedge by using this quiz.. interesting and useful. Use more specific examples from actual cases.